Bartlett employees are trained to think and act safely from their first day on the job. The performance of safe tree care on a client's property is foremost in importance at Bartlett. This emphasis benefits our employees and ultimately our clients in terms of service and cost. 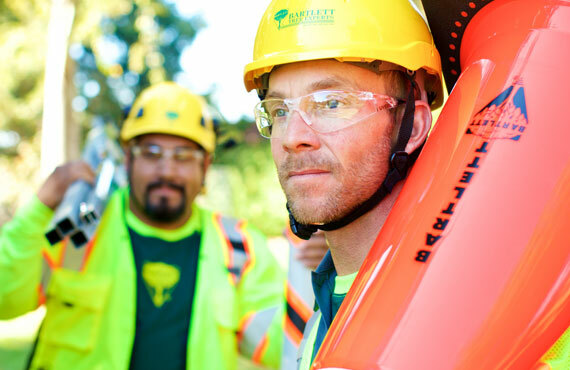 Bartlett Tree Experts is continually recognized as an industry leader in providing its employees the equipment and instruction necessary to safely perform arboricultural services. We have received the Tree Care Industry Association Safety Award 15 times in the last 15 years and are proud of our ability to provide clients with safety-conscious tree care. Safety and training coordinators assigned to each service region. Local Safety Coordinator assigned to each office. Corporate safety manuals issued to all crews. Qualifications for: Arborist Skills, Equipment Operator, Instructor. Mandatory weekly tailgate safety talks. Driver training and driver qualification. Regularly scheduled safety training sessions. Formal skills training courses for arborists. Through our training programs, Bartlett has developed safe work practices designed to prevent accidents. Safety is a mental attitude that requires a conscious recognition of potential hazards and a knowledge of the proper techniques used to overcome potentially dangerous situations. These safety precautions are built into every task performed by our employees. A safe workplace for both the employee and the client is imperative. Bartlett has helped develop industry standards for safe tree care operations. These guidelines provide safety standards for workers engaged in pruning, repairing, maintaining, or removing trees. ANSI, CSA, and EU standards are the recognized safety standards for tree care throughout the world. Bartlett adheres to all the safety requirements in the U.S., England, Ireland, and Canada. Our company shares similar goals with OSHA (U.S.), OHSA (Canada), and HSE (England and Ireland) to reduce occupational injury. Bartlett's reputation among these agencies is excellent.